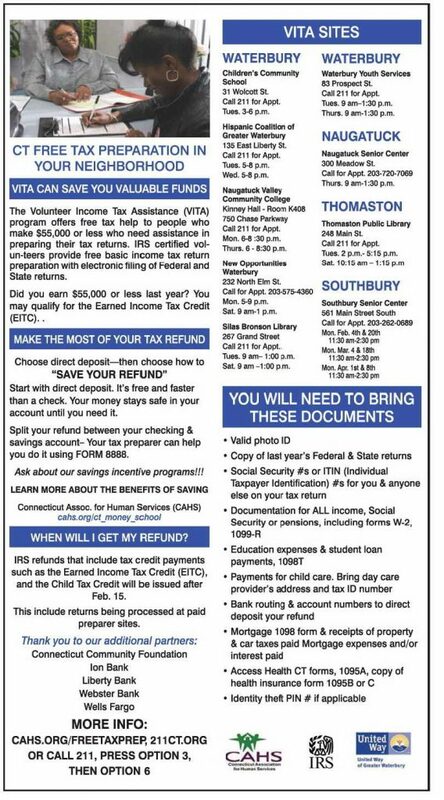 The Volunteer Income Tax Assistance (VITA) program offers free tax help to people who make $55,000 or less who need assistance in preparing their tax returns. IRS certified volunteers provide free basic income tax return preparation with electronic filing of Federal and State returns. Those who earn less than $55,000 a year may also qualify for the Earned Income tax credit (EITC). Tuesday 9 a.m. – 1:30 p.m.
Thursday 9 a.m. -1:30 p.m.